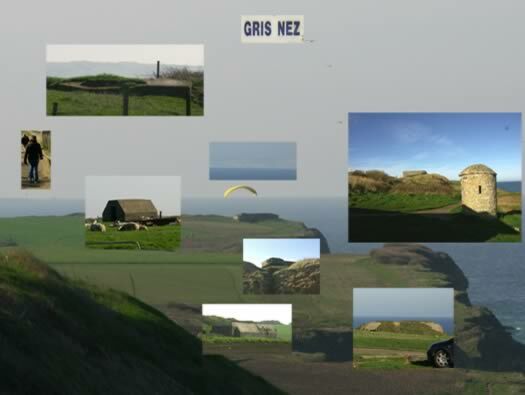 Stp161 Bumerang, Cap Gris Nez, K.V.Gruppe Wissant. 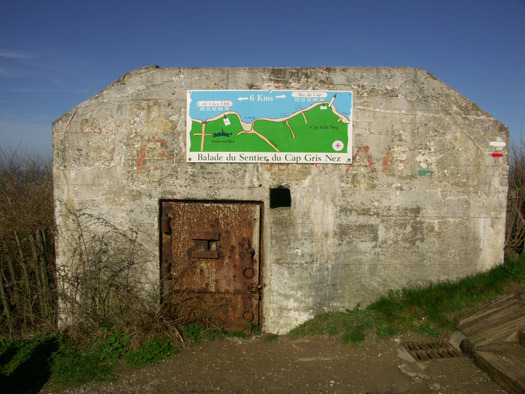 Stp161 Bumerang, Cap Gris Nez. 1 x 1 x Leitstand S100/SK. 1 x Leitstand with V229. 3 x Vf?. 1 Flakstellung. 1 x Fu.MG Seetakt Fu.MO 2 Gema. 1 x Würzburg See Riese Fu.Mo 214. From the D940 head for the Cap and park in the large car park. Würzburg See Riese Fu.Mo 214. 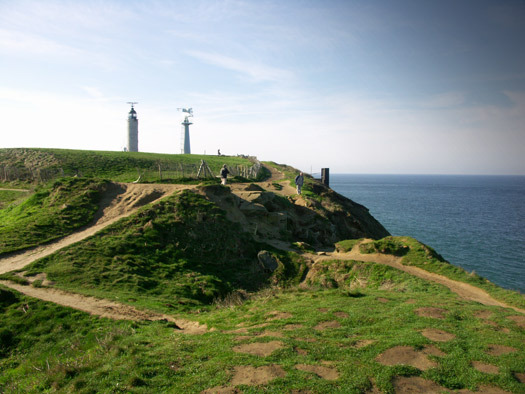 Cape Gris Nez is half way between Calais and Boulogne in the Pas de Calais region of France. 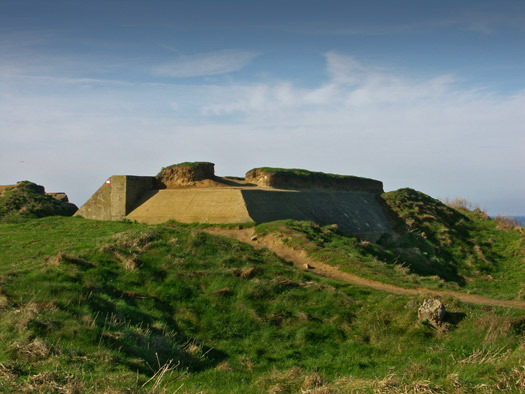 It is a high point sticking out into the English Channel with views of the south coast England and its white cliffs. 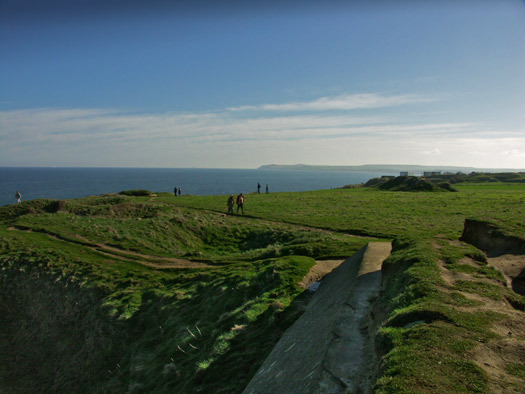 It was one of the first areas defended in 1940 and very large gun batteries were built around this area, but here I am just interested in the Gris Nez area (Gray Nose). 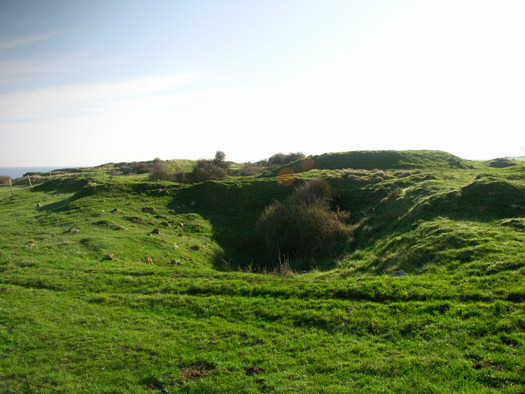 There are many bomb craters and shell holes in the area, it was shelled from England by long range guns and bombed at the time of being attacked by Canadian troops in 1944. 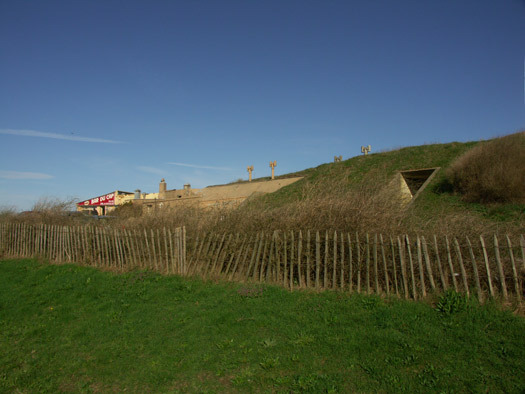 'Winnie' a 14" gun set into the hills at St Margret-at-Cliffe near Dover 1941. 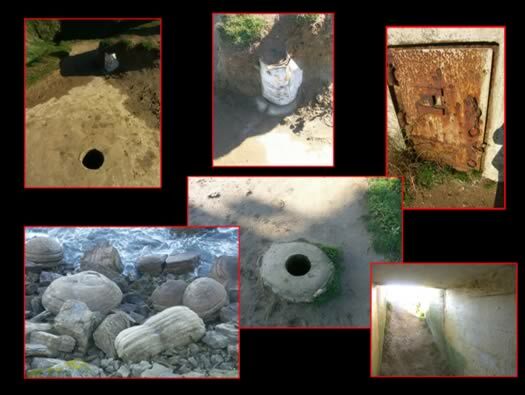 There were 27 of these shelters all over the Cap area. 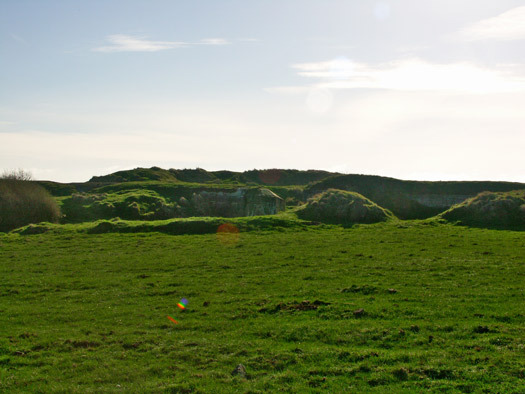 I believe there are older defences here, some must go back to the Stone and Iron Age and also Napoleonic period. 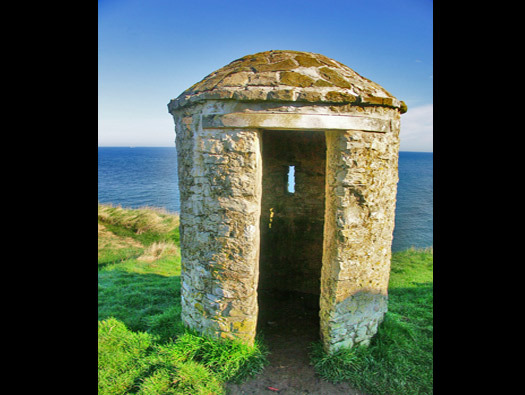 Another throwback from the Napoleonic days is this guard post. It must have been one of the most godforsaken spots in bad weather to stand and watch for an invasion by red coats. 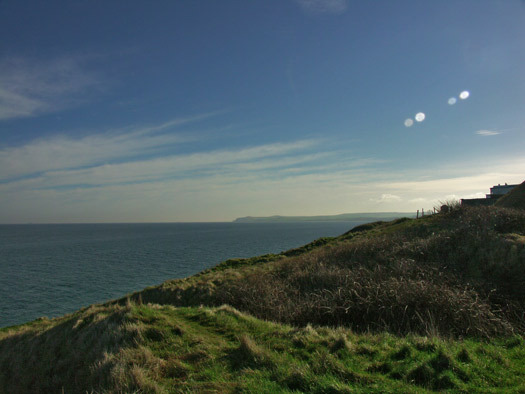 Cap Blanc Nez in the distance. A view to the Cap white Nose from the Cap Gray Nose. 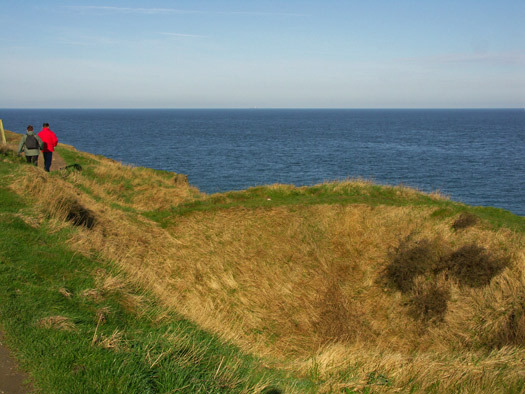 Another bomb crater on the cliff edge, these cliffs were bombed mercilessly by the RAF and USAAF to put the long range guns and radars out of action. 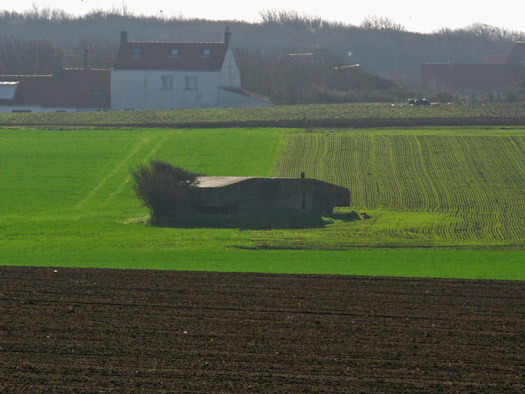 A square type shelter with windows in one side. Built in local brick and concrete. 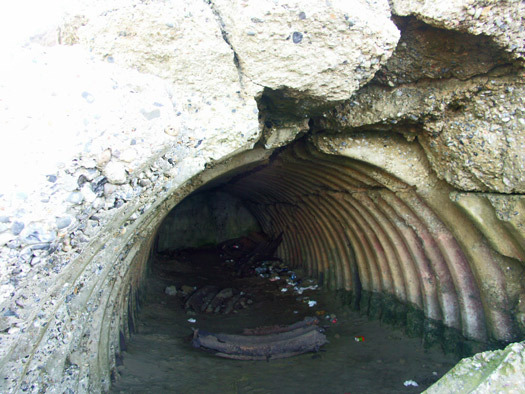 Another Wellblech shelter, a corrugated tin/steel, (much thicker section than the British Nissen hut tin). Covered with earth they would be quite strong against a near miss. 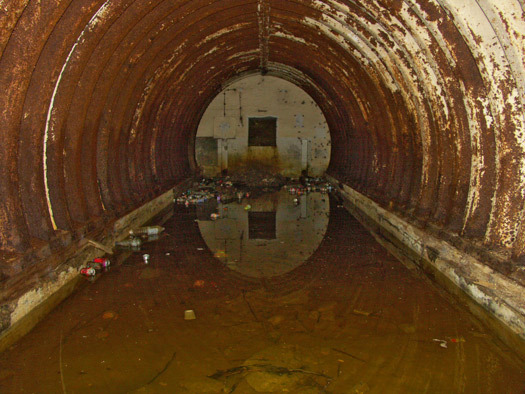 The inside in very good condition although it had water in it. 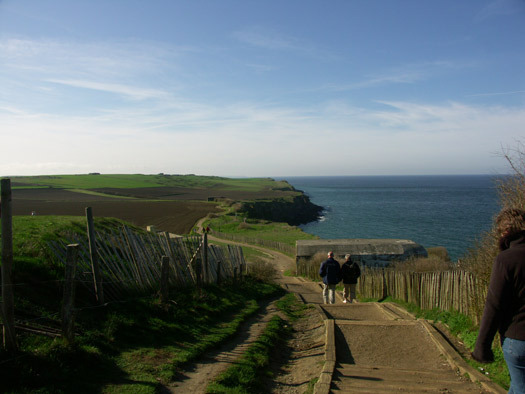 Cliff path from the Wellblech. 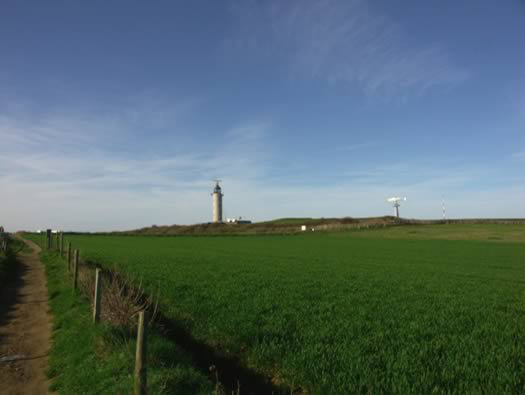 The Cap light house and shipping radar. Stp 161 BUMMERANG. 1 - FCP for Batterie Grosser Kurfurst. 2 - FCP with radar. 3 - FCP with 5cm Flak. Fu.MG Seetakt Fu.MO 2 Gema. 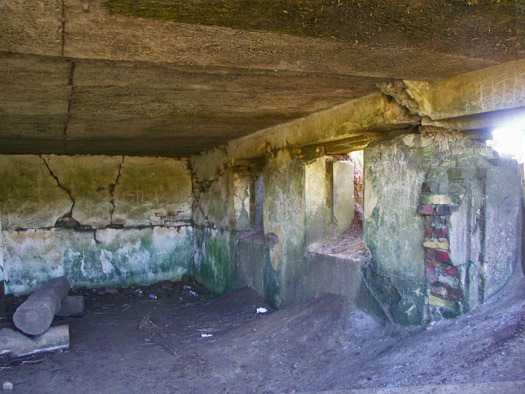 Inside another of the 27 Wellblech shelters. Here showing the strength of concrete over the top and the sheeting that has corroded badly. 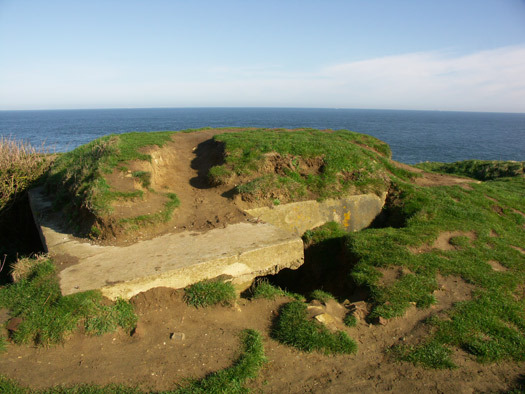 This could be the Leitstand (Fire Control Post). 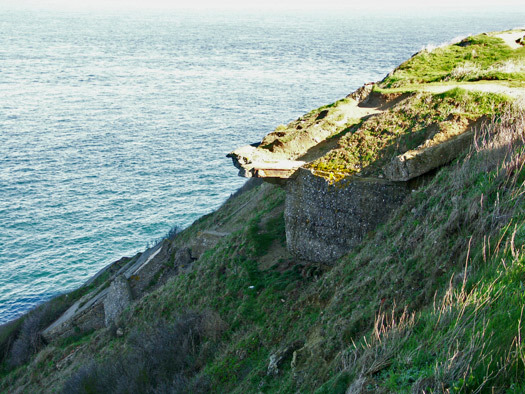 A lot of bits falling down the cliff. Peilstand one of three that were here. Peilstand's job was to measure with the main Leitstand and other Peilstand's to determine the range of a target by triangulation. A nice side on view. 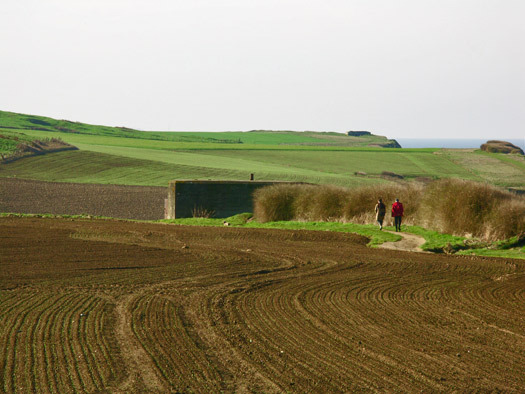 Looking towards the Notch-With-eggs, (what a lovely translation) and Cran de Quette with bunkers littered along the coast. Wn161a Pappenheimer Cran-de-Quette, Vf/B Stillen. (Vf/B Type). 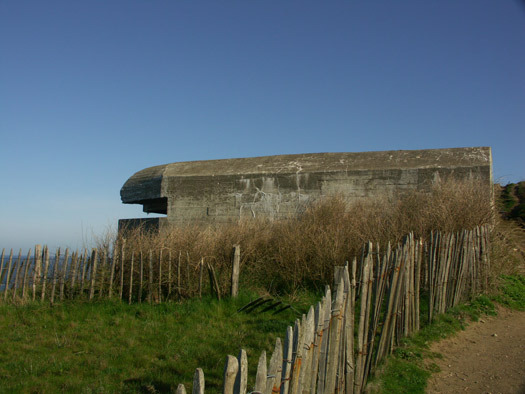 This could be Wn161a Pappenheimer, Cran de Quette? 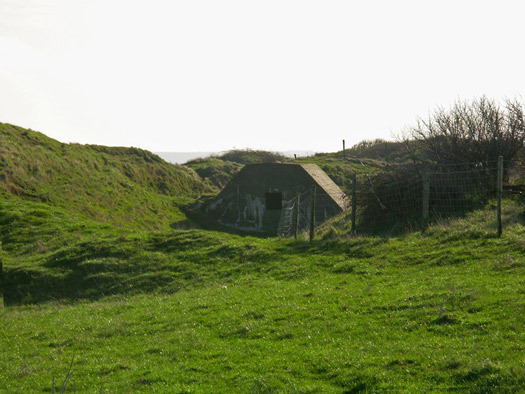 A view of the large bunker on the hill with its lighthouse and modern radar. 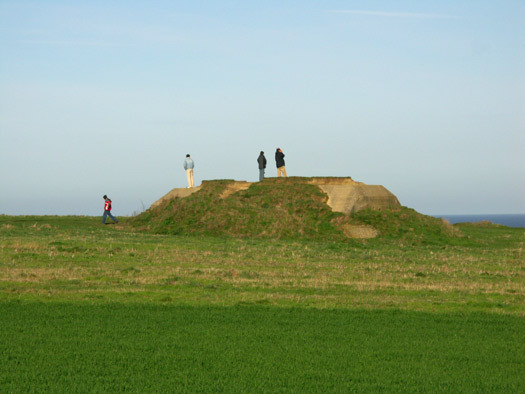 Looking along the mound of the bunker. 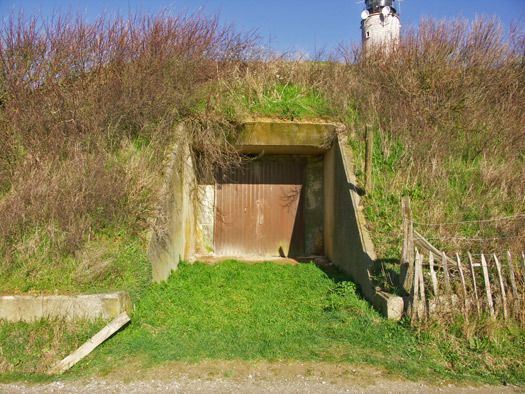 I have searched my books and every website but can find nothing on the bunker, if anybody can help me with this, please do..
One of the many doors. 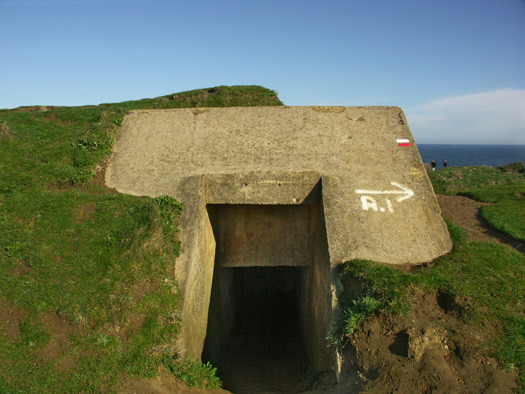 There are many doors set along this bunker. It could be for taking in and out machinery. 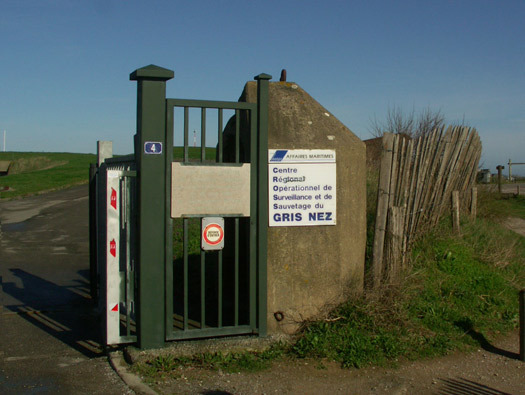 A concrete single person guard post situated at the main gate.